It's 1892 in Fall River, Massachusetts. 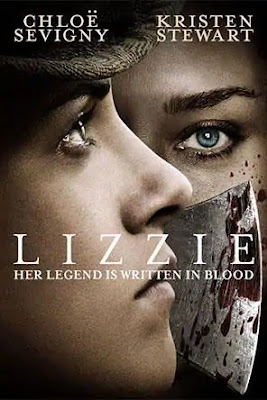 Lizzie Borden lives with her sister Emma, her father Andrew, and stepmother Abby. The family has wealth and lives comfortably, but Andrew rules the family with an iron fist, relying on psychological cruelty with withholding money to keep them in line. Bridget comes to the house to be employed as a maid, where Abby will call her Maggie as with all her Irish maids, and she and Lizzie form a friendship that turns into romance. When Andrew catches them together and threatens Lizzie with incarceration and already followed through with disinheriting her in his will. The next day, Andrew and Abby are found dead, killed with a hatchet and Lizzie goes on trial for their murder. I've personally been fascinated with Lizzie Borden and the murder of her parents since a young age, mostly because of the famous rhyme and my mother's strong opinion that I should go by my full name (Elizabeth) because any shortened version reminded her of the supposed murderer. I've read quite a few books on the subject that belabor where everyone claimed to be and the possibilities of who the murderer might be, but this film shows a different perspective. It recontextualizes the story into what Lizzie's life would be like in 1892 as an unmarried, queer woman. Her close friendship with actress Nance O'Neil in addition to a huge fight and later estrangement with Emma when she was much older may point to this being the truth, but we'll never know. Lizzie doesn't care what society might think of her being unmarried and going to social events by herself. She's portrayed by Chloe Sevigny as headstrong and confident, only bending when her father is especially cruel or a plan of hers backfires. Because of her father, she can't have a career of her own or take over his business, so she's relegated to taking care of the home and going to social events. Women at the time were essentially property that the men in their lives could do what they wanted with them and face no legal or societal repercussions. To go out on her own would be to have absolutely no resources and be completely ostracized from the society she lived in for her whole life. Being openly queer is also out of the question unless she wants to be put in an institution, which her father threatened her with when he caught her and Bridget together. Their relationship is an escape for them both, but acknowledges the troubling difference in their social standing where Lizzie has considerable power over Bridget. When her father reveals he disinherited her, it's the final nail in the coffin of her freedom. She would be equally beholden to her uncle who made it clear he doesn't care if she and Emma starve to death. Many factors put Lizzie's future in danger. Andrew Borden was first and foremost because he controlled what happened to his money with a will and proved to be quite unpopular because of his unsavory business dealings, which seems plausible considering the state of Fall River at the time. Threatening letters were dropped by their house and broke family members try to ingratiate themselves with him for money, further muddying the mystery and competing with Lizzie for her father's money. On a more personal level, Andrew was incredibly frugal, keeping the house free of electricity and running water even though he could afford the luxuries. The film portrays him as a cruel man who rapes women on his staff and commits cruel acts. 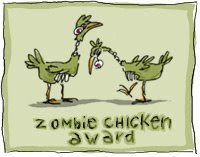 After Lizzie defied his wishes and embarrassed their family by having a seizure at the opera, he kills the pigeons she lovingly kept as pets and served them for dinner the next day. Looking at all of these things, there is a case for Lizzie killing her stepmother and father for her own safety and to secure the future for herself and her sister in addition to her own freedom. The film Lizzie is so different than any other portrayal of Borden I've seen and opens up many more questions. Other films make her a beautiful, smiling monster like the Christina Ricci Lifetime movie and series, where she killed a huge amount of people and kept getting away with it. This one shows the precarious nature of her position as a woman and a lesbian in 1892. The structure of the film works well, at first skipping over the murder, hearing Lizzie's version of events as she was questioned, and then flashing back to it at the end to reveal their version of events. Chloe Sevigny makes Lizzie relatable while still keeping her straight forward demeanor that put off police officers that questioned her. Jamey Sheridan makes Andrew a repugnant, angry man that I was frankly glad to see dispatched. 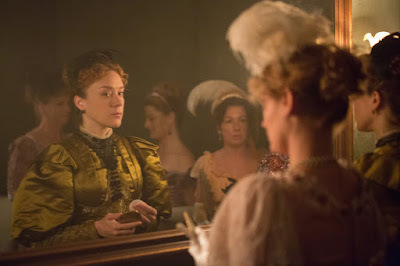 Lizzie is well worth your time and a passion project from Sevigny to show a different side to this notorious figure. Get Fishmuffins of Doom in your Inbox! Women in Horror Month X!!! Thanks Velvet and Zombie Girrrl!